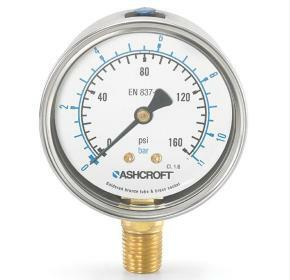 The Ashcroft® 8008A pressure gauge is designed to meet both EN837-1 and ASME B40.100, ensuring accuracy and long term performance. This high quality pressure gauge is easily retrofitted and offered with custom dial scales and logos. A perfect choice for hydraulic systems, compressors and many other OEM applications.